Paintball is quite the past time. It is the most perfect way to get together with friends or family for a day of fun and games. 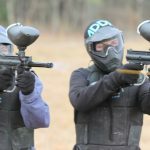 If you are a beginning paintballer, having the best Woodsball paintball gun can help you get the best accuracy and speed that paintball guns have to offer. 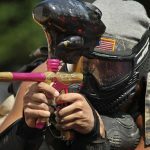 If you are an advanced paintballer, then you already know how vastly important having a Woodsball paintball gun can be. Below, we have found some of the best options on the market based on the value for your money to ensure that you are getting the best Woodsball gun for your next paintball adventure. Slim and sleek, this paintball gun is one of the best Woodsball gun types out there for beginners and advanced paintballers. Is has a semi-auto paintball marker, and the dual loading system is patented and ideal for long days playing paintball with friends. The magazine even holds up to nine rounds for long-lasting fun. This gun is rated by reviewers with a 3.3 out of a 5-star rating. There are many positive features as well. It is simple to clean, and it is well worth the price of the gun. There are a few negatives, however, just like with every product. The velocity of the gun is too high on first use, requiring adjustment. Otherwise, it will break all the paintballs in the barrel. 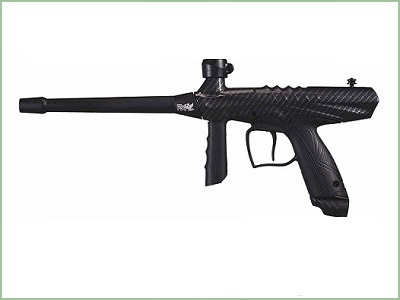 Overall, this paintball gun by Spyder is a great addition to any advanced paintballers stock, and even if you are a beginning paintballer, this gun is the perfect place to start. The price is budget-friendly, and the entire setup is perfect for easy loading and overall use. Tippmann is a well-known company that makes incredible paintball rifles. This particular gun is lightweight and rigid, which means it will hold up to your playing time no matter how rough you are on paintball guns. It has a completely new body frame from past models, and it has a better loader position to make it easier for you to use. This gun is rated a 3.7 out of 5 stars because it is an incredible product. However, there are a few negatives to this product like the fact that it tends to leak CO2 easily and the difficulty in attaching the CO2 bottle to the gun. Even though there are a few negatives, this gun is still perfect for things like gifts, prizes, and starter guns. In fact, this brand is amazing for novice users and even beginners. Whatever your needs, this paintball gun makes a best Woodsball gun. Sometimes, rifles aren’t the best option for your paintball adventures. In this case, you might be more apt to purchase a pistol to get the job done. This pistol also comes with a case and two clips to put your paintballs in. The barrel is large, and the metal trigger punctures the CO2 on the very first pull, so you don’t have to take blank shots to get started. This paintball pistol is rated 4 out of 5 stars for the 12-gram CO2 system and quick releasing magazine. 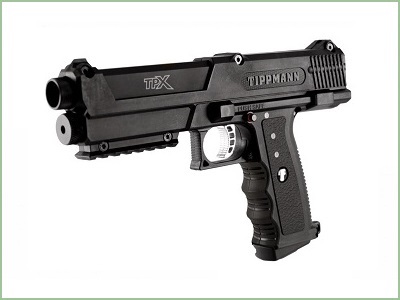 The Tippmann pistol is easy to load, which is why it lands a spot in our search for the best Woodsball gun for paintball. One of the few cons is the difficulty that it takes to clean the gun should a paintball break inside the gun. The materials are lightweight, but the gun is larger than many other pistols or handguns. For some, it could be too bulky to handle. Overall, however, this paintball pistol is great for getting a good grip and customizing, should you want to make it your own. 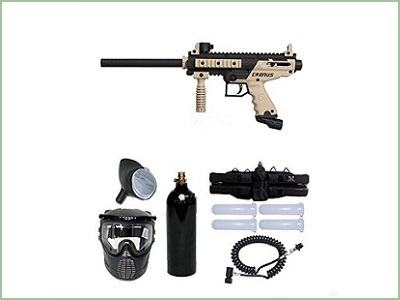 Having a rating of 4 out of 5 stars, this paintball gun set has everything you need. The gun, in particular, is an AR style that has a foldable and collapsible stock. The stainless steel gas lines are ideal for playing in any sort of weather, and the gun even includes adjustable and removable rear and front sights. 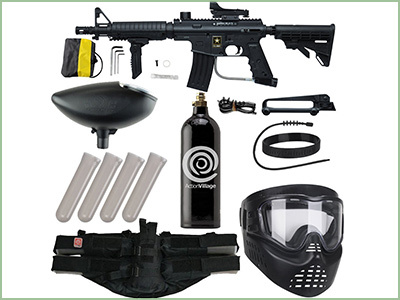 Luckily, this gun set has everything you need to enjoy your paintball fun. The only thing missing is paintballs in your favorite color, which is the only con to speak of. This gun has high power, and it is fairly accurate as well. The lightweight material is also ideal for both beginning and advanced users, and it performs up to most standards. 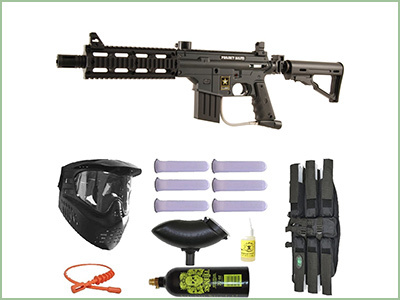 Moreover, the 3Skull paintball set is priced very well, which is perfect for even the tightest paintball budgets. 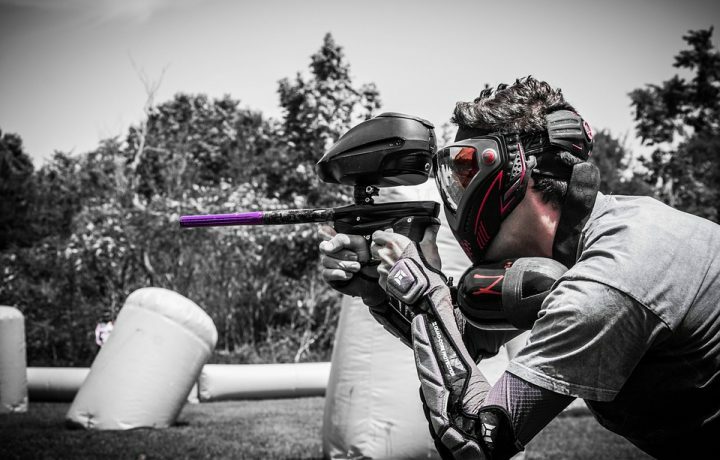 For more options, you can also check out these best paintball guns under 300 dollars. 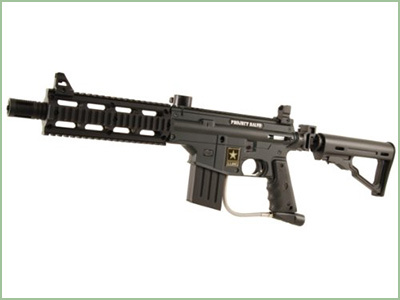 If you are looking for an AR style paintball gun, this US Army gun is the perfect one for you. This is a licensed product, and it has a collapsible and folding stock for easy storage when you aren’t using the gun. The product is made from stainless steel so it will hold up even in rainy or humid weather. Another interesting feature of this Woodsball paintball gun is the custom series response trigger compatibility. The gun has an AR style magazine that has the perfect storage compartment for when you are out on the field and need to reload. It even has adjustable sights in the front and the rear. Having a rating of 4.3 of 5 stars, this paintball gun has many things going for it. It is easy to clean up on the inside and easy to replace broken parts should you need to. Some of the negatives include a color design issue where the two colors do not match up, and the shroud is loose on the design, which could be a problem for some. Overall, this product is ideal for any paintballer. Paintball guns with a tactical twist are showcased by this Tippmann 3Skull set. This set comes with the gun, a CO2 tank, a harness, paintball tubes, and oil for your gun. 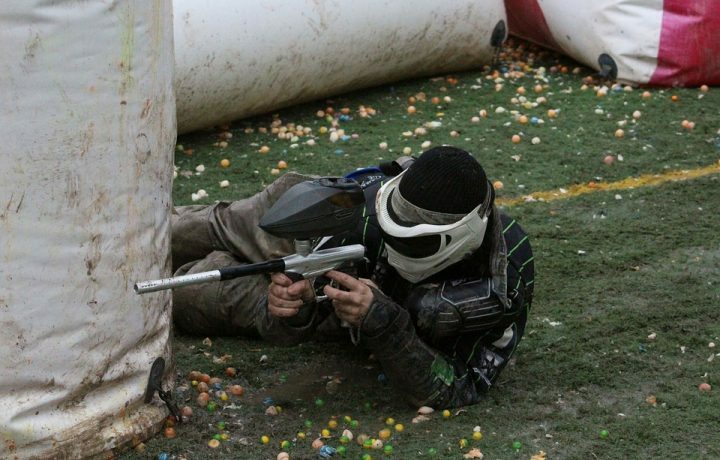 You have everything you need to enjoy hours of paintball fun whether you are a novice or a professional. Though it has impeccable accuracy, this gun can be rather loud. Another negative about this gun is the fact that it can’t be upgraded. However, there are several positives about this gun that make it ideal for all sorts of paintballers. It is priced ideally, and it has a cool design that looks rough and tough. This gun is even consistent when it comes to shooting out on the paintball field. If you are looking for a paintball gun to make your paintball times more fun and exciting, this gun is the one for the job. 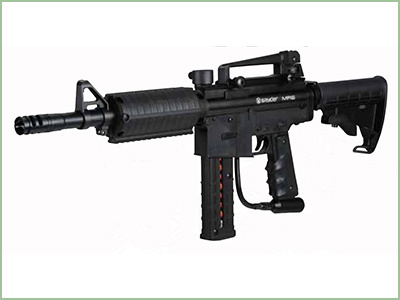 If you are searching for a great gun for your paintball outings, this paintball gun is just what you need. Included in the package are things like a carry handle, a CO2 tank, folding grip, harness, mask, and wristband. However, the gun is definitely the star of the show. The gun sports an excellent grip, which comes in handy when out on the field. It also has a rough and tough look for those who want something a little edgier. One of the negatives about the gun is the difficult assembly, which often requires users to look up a video to ensure they are assembling it correctly. Another important thing about this paintball gun set is the high rating that users have given it. With a 4.2 out of 5 stars, this paintball gun has so many positives, making it the best Woodsball gun for every type of user. Even though it is not fully automatic, this gun is still ideal for a gift or even for yourself. 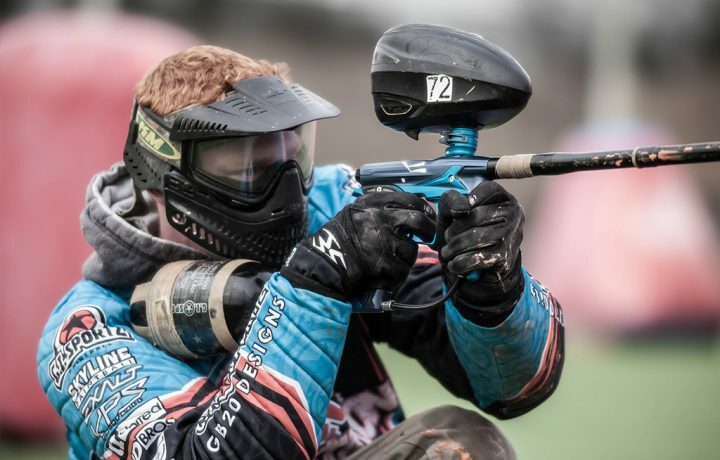 If you are searching for the perfect paintball gun, then we have the seven best Woodsball gun brands for you to choose from. These all feature things like sets, easy cleaning, and a great value for your money. 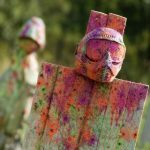 No matter what you are seeking, we have something for everyone on this list, whether you are a beginner or an advanced paintballer. 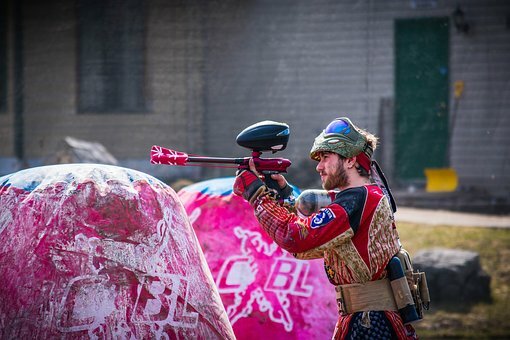 Paintball has never been more fun!